I woke up this morning in a confused state, not having the faintest idea where I was. Looking around I soon realized I was back home in Japan, and after being here less than 24 hours I knew I had to get up and get myself down to Odaiba for the D1 Tokyo Drift Exhibition. After the Italian Speedhunting trip, I was beginning to miss the JDM side of things and I'm quite glad to be back. 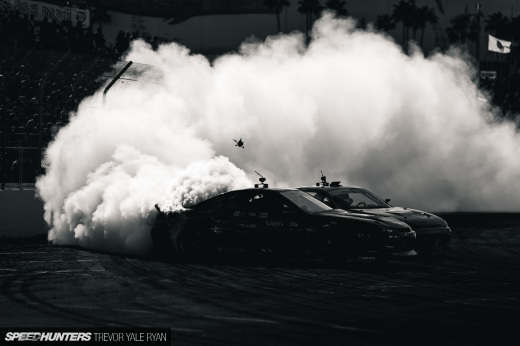 Nothing lets you know you are back in Japan like the smell of burnt rubber early in the morning! However there was far less smoke than we are used to seeing in D1, the dark skies were far from cooperative unleashing a good deal of rain throughout the day. As always the Japanese crowds were super accessorized and ready for anything. 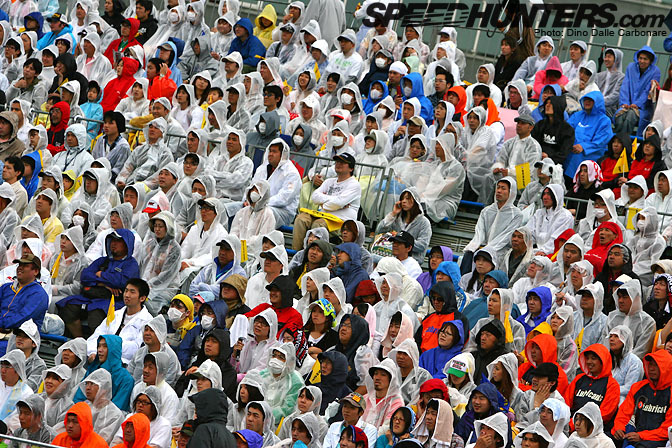 It's a good thing too as umbrellas were not allowed in the stands, for obvious reasons. It was quite a pleasant surprise to see fellow countryman Federico Sceriffo taking part in the exhibition. 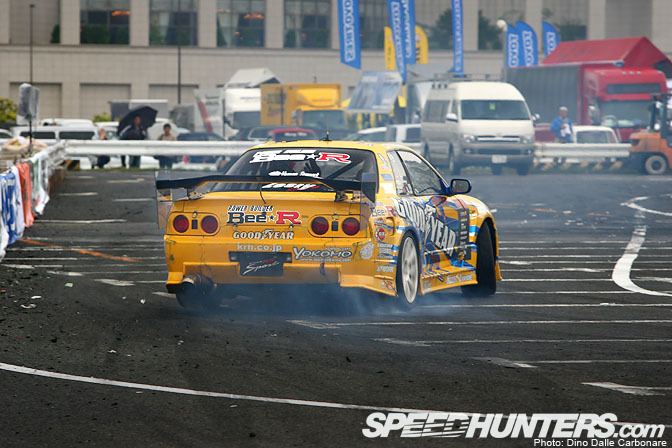 He is the first European drifter to participate in a D1 round in Japan. I though this Italian connection was quite a coincidence, seeing Speedhunters just got back from Italy! Here he is getting ready to go out for the Best 16 against Hibino. He ended up hitting the soft foam barriers following a very aggressive entrance into the main judged corner. Many other drivers would follow. 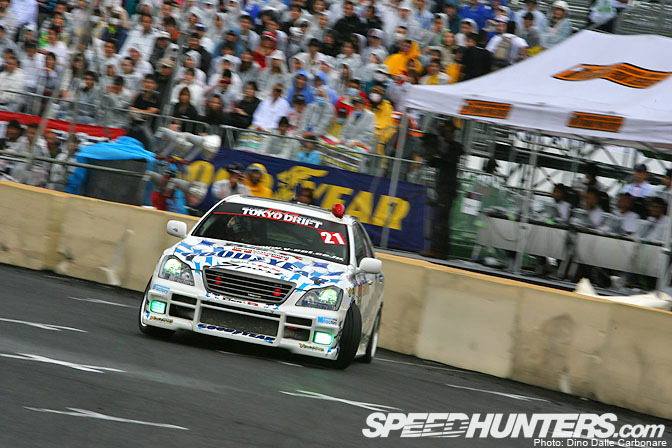 Sceriffo was driving Kumakubo's 2006 GDB, sporting special livery similar to the one he has on his drift Impreza in Italy. Team Orange just keeps getting bigger and bigger! 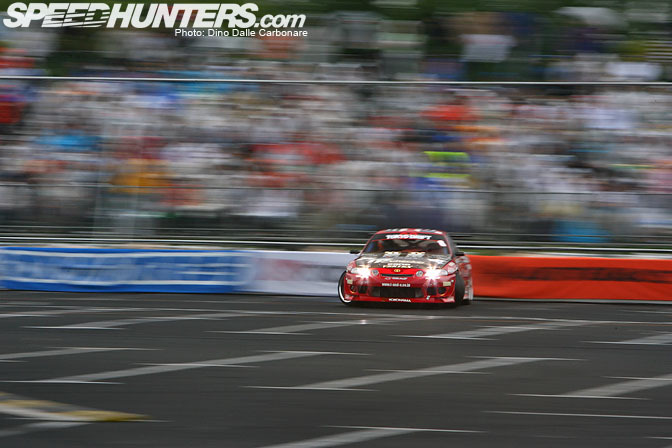 Seriffo will be back in D1 at the end of August, for Round 5 in Ebisu. Kumakubo was on form, but unfortunate mistakes due to the slippery conditions didn't allow him to get as far as he could have gone. 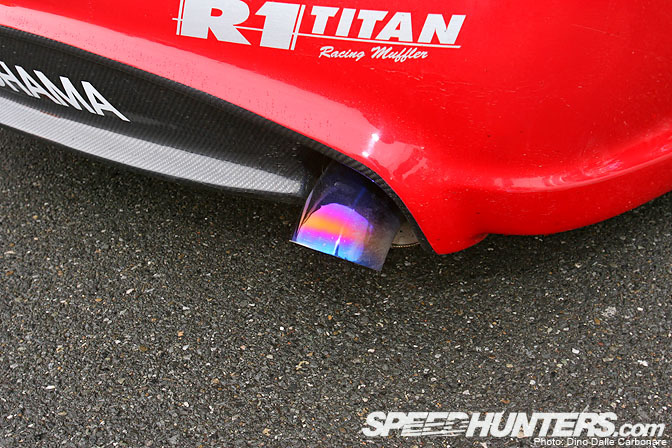 You may have noticed that all the D1 cars were running downward pointing exhaust tips. For a moment there I thought the RE-Amemiya dolphin tail had caught on all of a sudden, but it is actually a requirement for Odaiba, something to do with the noise I believe. While most teams got around this by welding the bend onto the existing pipe, Orido was just showing off with this one-off titanium back-box fitted to his Aristo! 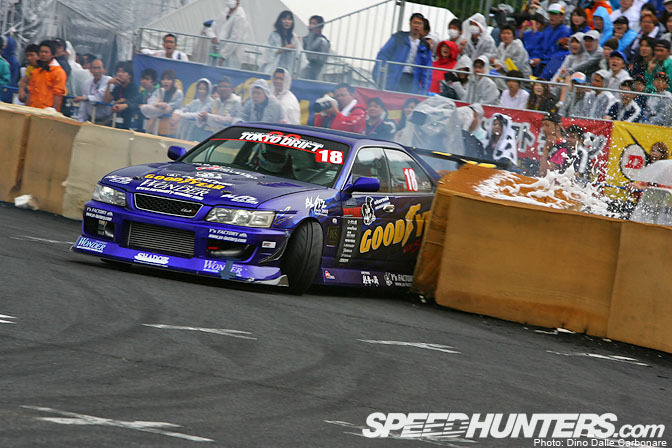 Odaiba is a dangerous course, as there is a lot of concrete to hit! 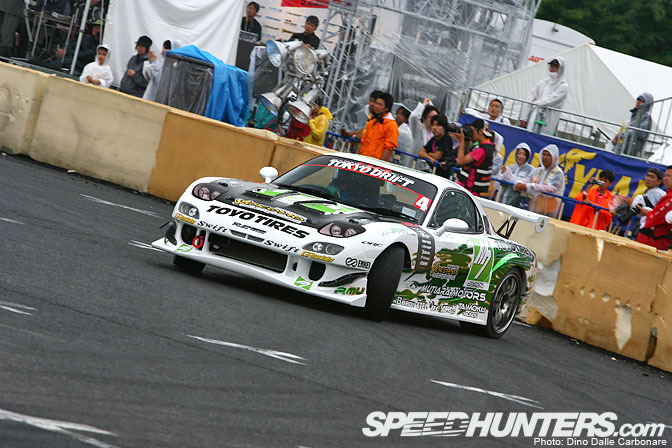 Some drivers preferred to use something else for the exhibition, like Suneaga opting for his D1-SL RE-Amemiya FD3S. Ueno was thinking along the same lines, leaving his recently competed 2JZ-powered BMW 3-series on display in the paddock and driving the old Soarer (see opening shot). You have got to give it to these guys, I mean just look how close Suenaga is to Kawabata here on such a tight track. In the wet! This is as good as car control gets. I thought Tokita's new mod for his Bee-R Crown was pretty hilarious. Have a look at the twin undercover police lights behind the grille, as well as the roof mounted one! This Crown would no doubt keep up with all those pesky Wangan racers! As summer gets closer the umbrella girls' outfits start becoming ever so skimpy. I like. The wet and slippery asphalt caught many out. 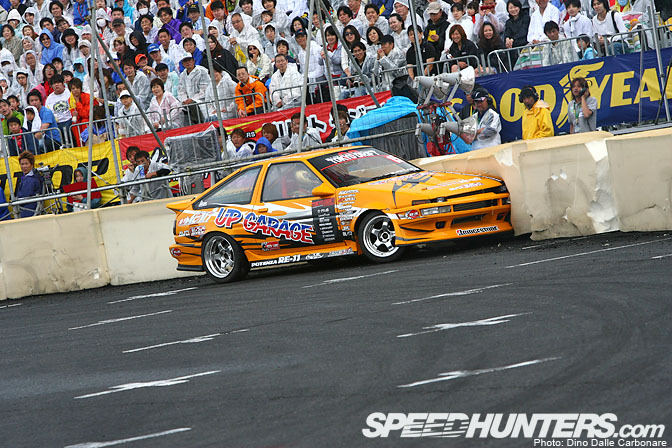 Check out as the C35 of Haruyama plunges back-end first into foam barriers! A lucky soft hit for Ken Maeda! This was by far the worst crash of the day as Mizuhata hits the barriers sending the foam blocks flying in the air. 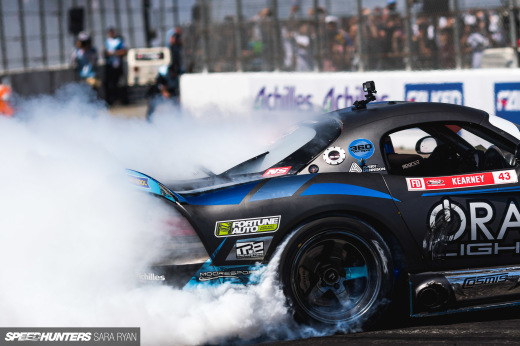 Tokita, who was following, came in hard at an angle and hit the HPI S15 adding to the spectacle, and damage! The poor Silvia limped back to the pits with bits of body work hanging off. 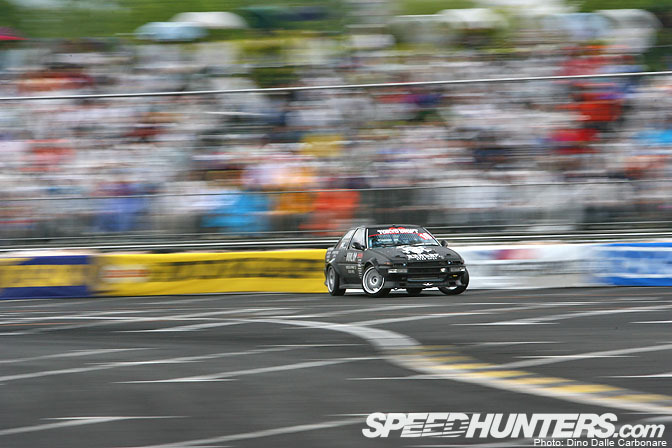 Hibino was taking advantage of the slippery conditions, getting the best out of his newly painted, matte black AE86. There was plenty of amazing action in the Best 16 but it was Nomuken and Tezuka that ended up in the final. And what a final it was with countless perfect runs from both. Both the judges and crowds called for repeat rounds with the whole thing ending up in a "sudden death" battle. 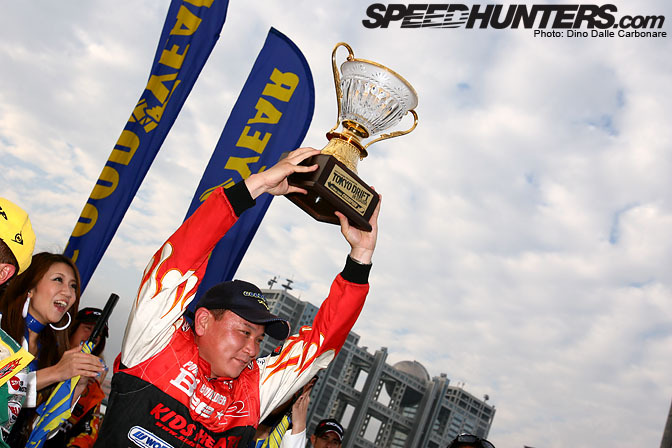 In the end it was Tezuka that grabbed the Tokyo Drift trophy, a great result for Imai-san and the whole Bee-R team. 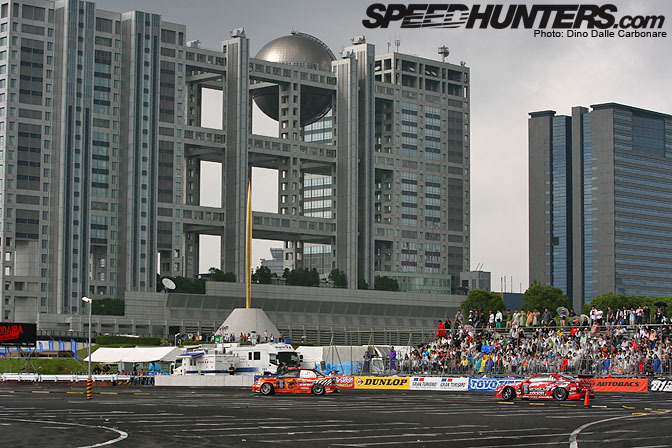 To see the rest of the cool action from Odaiba you will have to stay tuned for Part 2! Make sure you don't miss it! my neck hurts from looking at all of these shots :P.
i will second the motion for a desktop of the opening photo! YAY!! Dino was back for the TOKYO DRIFT EXHIBITION! I thought there would be no coverage for this special event. Nice shots and write-up as usual Dino. the matte black ae86 is my favorite photo of the whole lot of em. PS. Uchh... Nomuken again 2nd... Argh. Tezuka has a R32 with a R34 front. Great work of my friend Federico Sceriffo. Nice photo,as always the most beautiful. What do Ueno, Hibino, and the MaeKen AE86 Race Queen all have in common? 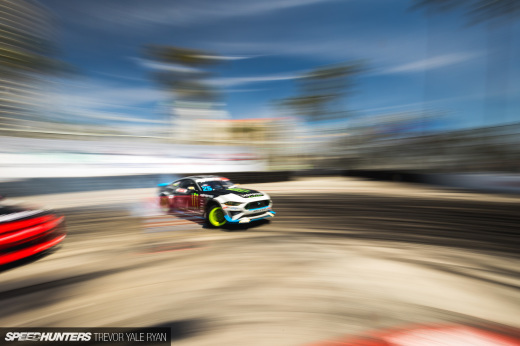 Great photos & coverage Dino, can't wait to get back behind the lense for this weekend ! CIao Dino, grazie dello0 spazio dedicato al nostor Sceriffo! Next time you will come to italy, please give me a call! Grande!!! 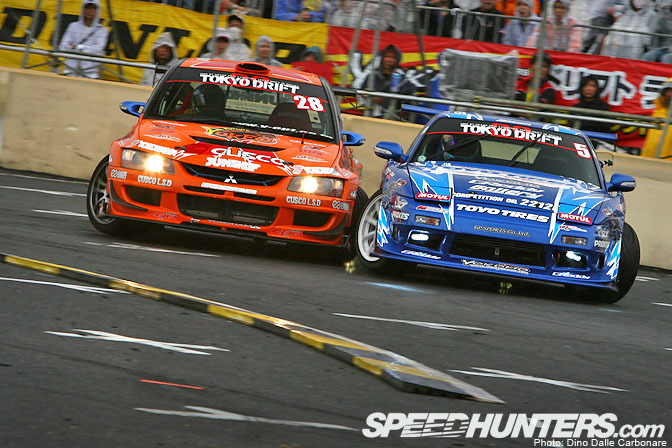 nice to see an italian in D1GP, amazing! 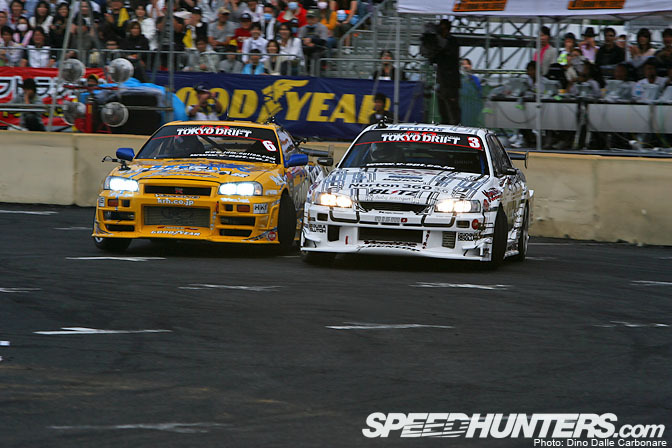 cant wait to see rd.5 in Ebisu! Yes! I too request the opening shot as a desktop. Thanks for the positive feedback guys. I'll try and get that desktop ready for download too! 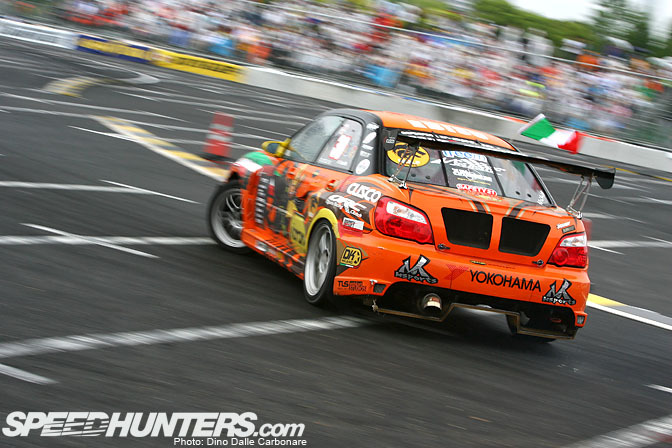 Well I just wanna ask this, is Federico Sceriffo really using Kuma's 2006 GDB? Didn't know he had one in LHD, or was it specially converter for Federico? Great shots as always Dino, and congrats to Tezuka on the win. If only the cars weren't so ugly. the car is converted to the LHD because Federico used to drive LHD car during his practise. In Italy we dont have RHD for training. Desktop of the shot with Suenaga and Kawabata!! Awesome shots.